If you enjoy bird watching in your back yard, the Cardinal is a beautiful bird to attract. The male Cardinal (redbird) is a gorgeous bright red bird who will add brilliance and color to your yard. Cardinals are not only beautiful in color, but known for their sweet songs as well. The male and female will communicate through song often, with the male singing first, and then the female replying. Year round, the Cardinal’s song can be heard. Watch for signs of courtship between the male and female. During this time, you might get to see the male feeding the female as she sits on a nest. When the Cardinals come to visit your yard, you’ll enjoy many lovely sounds and songs! By providing the basics of food, water and plants for nesting or resting, you can have these beauties visiting your yard often. Some of the Cardinal’s favorite foods are fruits and berries, weed seeds, farm crops, caterpillars, grasshoppers, beetles and insects. If you develop a feeding station in your yard using a feeding tray or similar feeder, the cardinals will enjoy some other “tasty” treats such as sunflower seeds, cracked corn, peanut butter, nuts, millet, fruit and mealworms. Nesting season for Cardinals is from March to August. They like to nest in thickets, young evergreens, or briars for protection from danger and bad weather. Another common nesting location is near a stream for a water supply and bathing. The female will lay two to five eggs at a time, and normally the pair will have two to four broods in one nesting period. While the female incubates a batch of eggs, the male will take care of the newly hatched young. The young Cardinals only remain in the nest for around ten days. If you provide the right environment you could have a whole family of beautiful cardinals singing right in your backyard! Beware: The cardinal male is extremely protective, and if the birds nest near a window, the male may try to attack his own reflection. If this happens, try to hang something up that will block his reflection during this time. Otherwise, he may hurt himself. Evergreen trees attract Cardinals for nesting because they provide protection and shelter. Sunflowers and safflowers attract the Cardinals because the birds love to munch on the seeds. 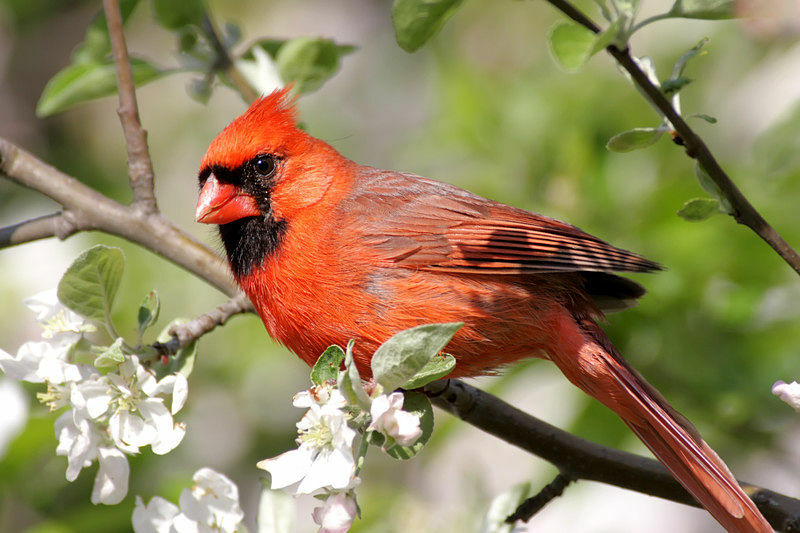 Other trees and plants that attract the cardinal are maple trees, cherry and apple trees, corn, oats, coralberry, vervain, sumac, spicebush, mulberry, roses, dogwoods, holly, brambles and grape vines. As you can see, the possibilities are almost endless! You have many choices of ways to attract these lovely birds. One last tip to remember is that Cardinals prefer eating from a tray or directly from the ground when you supply their food by hand. Offer a variety of plants that Cardinals love, and you’ll see them coming soon! Hey Buddy!, I found this information for you: "How to attract Cardinals to your yard". Here is the website link: http://backyardbirdingblog.com/how-to-attract-cardinals-to-your-yard/. Thank you.